A great line up of speakers for the free talks in Paris! Following the last year edition, we comeback each Wednesday in Paris for the #tptalks16. A serie of talks open to the local parisian public and available online to the world. This is a free event but the venue is limited to 130 people. After this limit, you will be added to the waiting list, and your entry will not be fully guaranteed. Our Talks will be given in English (by our international guests speakers). Meanwhile, as the #tptalks16 are organized in Paris, France, most of attendees will be Parisians. Le Français sera largement employé par les participants lors de l’inscription et des échanges nombreux durant la soirée. Each attendee will receive a free tote-bag full of goodies: type specimens, brochures, note-book, stickers and so on! Sponsors corners, TypeParis type design programme attendees meet up, and various attractions planned, as well as dishes and drinks. Élise Muchir, Franklin Desclouds + Indra Kupferschmid, tptalks16. Register for free now. Only 130 seats available for Wednesday 22 June 2016, at Le Tank: Indra Kupferschmid + Élise Muchir, Franklin Desclouds (Des Signes). Facilitator: Sandra Chamaret. Indra Kupferschmid is a freelance typographer and professor at HBKsaar, University of Arts Saarbrücken, right at the border to France. Fueled by specimen books and coffee, she is occupied with type around the clock and in all its incarnations – webfonts, bitmap fonts, other fonts, type history, research, marketing, DIN committees, design work, and any combination of this. Élise Muchir and Franklin Desclouds met during their graphic design and multimedia studies at École Nationale des Arts Décoratifs (ENSAD) in Paris. Their common and complementary sensibilities led them to co-found the graphic studio Des Signes in 2003. Firmly convinced of the link between graphic design and art, Des Signes projects, year after year, convey a specific aesthetic. Typography became an essential creative vector for the studio. Sandra Chamaret co-directs the graphic design studio Grand ensemble since 2005 and operates in the areas of global identity, museum identity systems, signage and publishing. Deeply concerned about how information is transmited to the public, she is particularly interested in visual heritage issues, mediation, information design and research. In 2010, she co-wrote the monograph “Excoffon and Olive foundry”, a historical and critical research about the typographer. In 2016, she founded the publishing house of -zeug: books + exhibitions – Design + typography. Pierre di Sciullo + Martina Flor, tptalks16. Registration will open on 20 June 2016. Only 130 seats available for Wednesday 29 June 2016, at Le Tank: Martina Flor + Pierre di Sciullo. Facilitator: Geoffrey Dorne. Helena Ichbiah + Peter Bilak, tptalks16. Registration will open on 27 June 2016. Only 130 seats available for Wednesday 6 July 2016, at Le Tank: Helena Ichbiah + Peter Bilak. Facilitator to be confirmed. Bernard Brechet + Alexandra Korolkova, tptalks16. Registration will open on 4 July 2016. Only 130 seats available for Wednesday 13 July 2016, at Le Tank: Alexandra Korolkova + Bernard Brechet. Facilitator: Michaël Chaize. Registration will open on 11 July 2016. Only 130 seats available for On Wednesday 20 July 2016, at Le Tank: Leslie David + Lucas Sharp. Facilitator: Véronique Marrier. 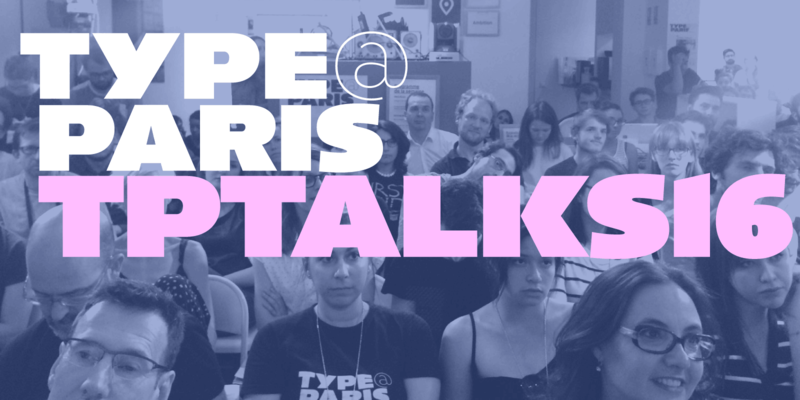 Official hashtags are #typeparis16 #typeparis Official hashtag for Type@Paris Talks 2016 is #tptalks16 Please use them for any of your social networks! Your tweets, instagrams will appear on a dedicated page following the event. Thanks to our Platinum sponsors: Adobe, Typekit. Interested in sponsoring? Download the Sponsorspack.